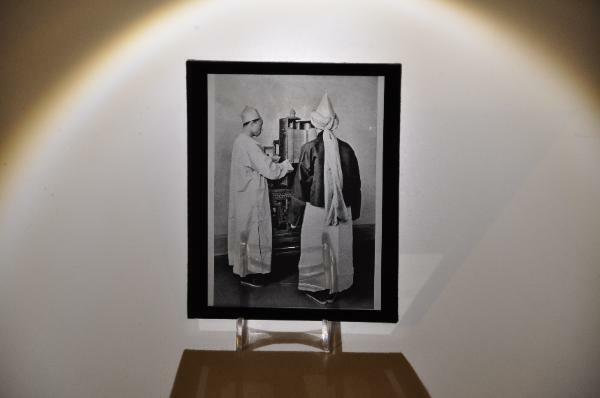 This rare image in the form of a magic lantern slide shows two members of the now largely extinct community of Chinese Jews in Kaifeng in Henan Province. They are reading a torah scroll which stands on an unmistakably Chinese-style table. Most likely, Kaifeng’s Jews had their origins in the Jewish communities of central Asia and came to Kaifeng along the various trade routes, collectively known as the Silk Road. The community is believed to have survived in Kaifeng for more than 700 years during which time its moral beliefs and cultural practices remained largely intact. The existence of a local Jewish community in China was first informed to the outside world by the Italian Jesuit Matteo Ricci at the beginning of the sixteenth century. Matteo tells of meeting in Beijing a Kaifeng Jew called Ai Ti’en who because of their shared belief n one god assumed that Ricci must also be a Jew. Bishop William Charles White of the Canadian Church of England sought to systematically chronicle the community’s practices. He headed the church mission in Kaifeng between 1910 to 1933. Early on he collected information and artifacts relating to the community. In 1912 he obtained several steles dating from the fifteenth and seventeenth centuries. These have remained in Kaifeng. However other items did not, including stone bowls for ritual washing, a temple chime, and a wooden cylindrical torah case – quite possibly the one shown in this lantern slide. These items are now in Toronto’s Royal Ontario Museum. (White also collected non-Jewish items which also are now in the Museum. One of its gallery’s is named the Bishop White Gallery of Chinese Temple Art.) White also collected several or more of the community’s torah scrolls which are believed to have been distributed to libraries and museums worldwide. The Chinese Jews, was published. The image in this lantern slide appeared in the first volume and is a copy of that image. It appeared with the caption ‘Reading the Torah: Three persons took part in this ceremony. 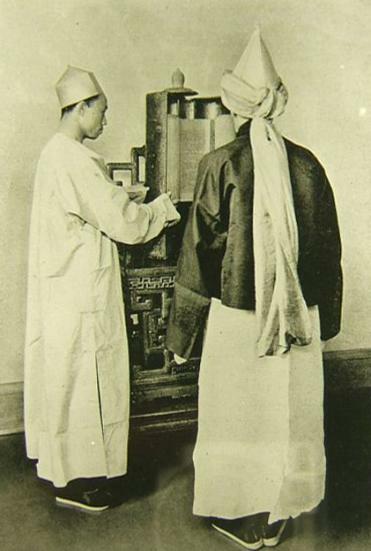 The reader wore robes prescribed for dress occasions, and had a cloth wound round his cap to simulate a turban, and hanging down behind like that of the Mohammedan use of today.’ Probably, White took the photograph himself, and would have done so soon after he arrived in Kaifeng when his collecting of the community’s artifacts was at its peak. White later became Chinese curator at the Royal Ontario Museum and director of the University of Toronto’s School of Chinese Studies. Lantern slides were used during the 19th century up to the 1930s. Most slides are 3.25 inches square (English Format) or as in the example here, 3.25 by 4 inches (American Format). Slides consist of two pieces of glass bound together with gummed paper strips so that the photographic emulsion is protected between the two plates of glass. Xu X., The Jews of Kaifeng, China: History, Culture and Religion, KTAV Publishing House, 2003.